God the Father led His only begotten Son to suffer for us so He could rise for us. The following are principles in Scripture and life showing how suffering precedes glory; death comes before resurrection. Truly, we cannot have a solution unless we have a problem; we cannot have an opportunity unless we have a challenge; we cannot know what is good unless we experience what is bad; we cannot experience what is best unless we experience what is worst; we cannot have love without hate; peace without anguish; joy without depression; forgiveness without unforgiveness; healing without sickness; peace without trauma; courage without fear; pleasure without pain; excellence without sloppiness; diligence without laziness; competence without incompetence; success without failure; purpose without meaninglessness; power without powerlessness; mercy without wrath; life without death. In order to understand and fully appreciate the resurrection of Christ, we must appreciate and understand Jesus’s trauma on the cross. 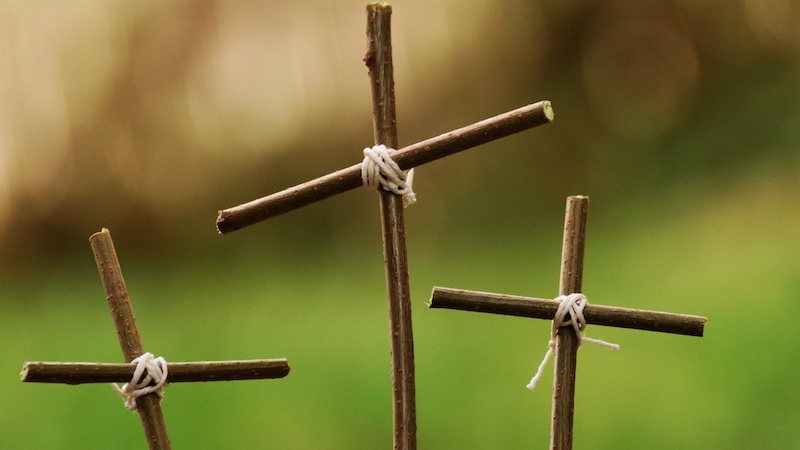 The cross came before Pentecost; Good Friday came before Resurrection Sunday. A. We have experienced anguish of soul because of our separation from God. Jesus reconciled us back to God by His death on the cross (Colossians 1:21). B. Symptoms of separation from God include a continual sense of guilt and sin, fear of the next life, always attempting to substitute peace with happiness and never really landing anywhere, attempting good works to expiate a sense of sin, and living a life of debauchery to forget your painful reality. C. I was like a wanderer in the desert before I knew the Lord, always trying to find peace in different accomplishments or friendships. I could never find what I was looking for! There was a continual sense of searching, loneliness, and emptiness even when I was with a crowd of people. The anguish of my soul with rejection, broken relationships, and meaninglessness paved the way for the greatest joy in the universe to enter my life when I surrendered to Christ. After receiving Christ I had peace in my heart because my sins were washed in His blood. I had a sense of joy in His presence and felt that I truly belonged in a community because of His church. This is why I love His church so much and have dedicated my life to it. A. We who have experienced separation from people (whether it is a parent, a child, or a broken heart) have experienced great anguish and trauma. Christ rose to give us new hope and “togetherness” with Him and His community, which can heal all wounds. B. It’s a lonely world out there. Many people do not think they fit in anywhere. But God has united us with Him and His body so we can be whole in our relationships in the family of God! C. It is very difficult when your heart is broken because of separation from a loved one because you have invested so much of your time and connected so much of your emotions to a certain person that is no longer present. The hardest part is that you have to get used to doing daily things and experience life without this other person’s involvement. Hence, part of your emotional life is missing and you are walking around as half a person in your mind! It is especially hard during special times like birthdays, anniversaries, and holy days like today because we attach a face to each of those days. D. We do not know the joy of unity in community unless we have experienced division within humanity! Once we have community with God and people, we do not ever want to walk away from it, and if we do we cannot ever forget it (1 Corinthians 12:12-13)! Nothing takes the place of being in church on Sunday and experiencing community in a home group during the week! Online services, messages, and media preachers cannot touch you the way a live church community can touch you! E. Because of His death and resurrection, He has given me the hope, the love, the power, and the mindset to have a family and be a family. I never pictured myself getting married and having children and being a father before I was a Christian. F. Now, because of His death and resurrection, I have numerous mothers, fathers, sisters, brothers, and spiritual children because I am now grafted into the spiritual community of God! “Every man is an impossibility until he is born” (Ralph Waldo Emerson). A. When Jesus took my place on the cross and rose from the dead He broke the power of whatever was holding back my gifts, abilities, and potential (sin, Satan, separation from my true self and God). B. Trying to function in life without God would be like purchasing an expensive car like a Lexus, and then moving away to a country that does not have a Lexus dealer or any of the parts you need for repair. You may be okay in the infancy stage of the life of your car, but as time goes on and things start breaking down, your car will not be able to function properly unless you go back to your maker for parts and services. C. When we give our life to Christ we cross over from a death-filled life of separation to eternal life filled with exciting possibilities that begin in this life (John 5:24; zoe life begins now!). D. Although in sin we fall short of the glory of God, in Christ we come into and walk in His glory (Romans 3:23; 6:23; Ephesians 2:4-6). E. On earth we were thrown out of His garden away from His presence, but from heaven Jesus has released gifts unto His church so we can replenish the earth with His presence as His ministers (Ephesians 4:10-12). “If you would not be forgotten, as soon as you are dead and rotten, either write things worth reading, or do things worth the writing” (Benjamin Franklin). “Do not live as though you have a thousand years” (Marcus Aurelius). 1. If you are a sinner/separated from Christ, come forward and give your life to Him so you can be reconciled today with your Creator. 2. If your heart is broken, then experience community with God and His church. 3. If you are not functioning in a ministry for God, then get involved in your community and in your church.